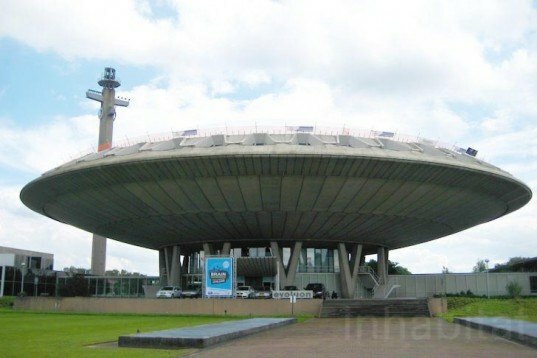 Eindhoven's Colossal UFO-Shaped Evoluon Center is Out of this World! 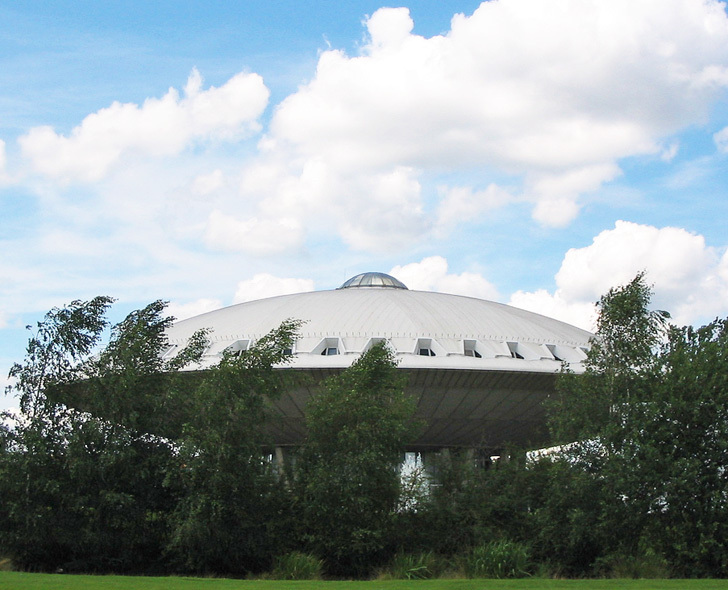 Eindhoven’s Colossal UFO-Shaped Evoluon Center is Out of this World! Eindhoven's Evoluon is an out-of-this-world building that serves as a multi-purpose conference and events center. Shaped like a flying saucer, it was commissioned by Dr. Frits Philips -- who made the first sketches of it on a napkin -- and built by architect Louis Kalff in 1966. An innovative building and a proud icon of science and technology, it has always attracted a large number of visitors thanks to its unique interactive exhibitions. Standing within the Dutch City of Design & Technology, the Evoluon is a daring and iconic landmark. Its concrete dome is 253 feet in diameter and it was originally built to give the people of Eindhoven a beautiful and educational gift as a celebration of Philips’ 75th anniversary. Nowadays, the Evoluon is deeply involved in hosting sustainable exhibitions, events and parties. It offers companies a free online ‘Green Checklist’ and CO2 calculator, including tips on how to reduce waste, lower energy costs and choosing green conference materials, while helping save money. Who would have thought that Philips designed amazing and green UFO-like buildings in addition to light bulbs! Standing within the Dutch City of Design & Technology, the Evoluon is a daring and iconic landmark. Its concrete dome is 253 feet in diameter and it was originally built to give the people of Eindhoven a beautiful and educational gift as a celebration of Philips' 75th anniversary. An innovative building and a proud icon of science and technology, it has always attracted a large number of visitors thanks to its unique interactive exhibitions. Nowadays, the Evoluon is deeply involved in hosting sustainable exhibitions, events and parties. It offers companies a free online 'Green Checklist' and CO2 calculator, including tips on how to reduce waste, lower energy costs and choosing green conference materials, while helping save money.